For natural nail tip extension, gel nail art design, fiberglass nails making and french nail making. Includes 50 colour pop sticks on a fan. 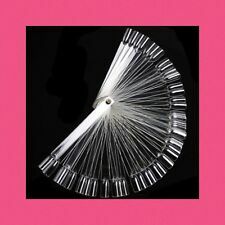 High quality clear nail art / colour display fan. Perfect For Nail Art or Practicing - Great for Nail Techs. Violet Vixen. - 24 Nails. This all-in-one manicure kit gives you pretty, perfect, ping-proof nails in minutes! Check out the Elegant Touch Nail Guards we have listed too :D.
This all-in-one manicure kit gives you pretty, perfect, ping-proof nails in minutes! - 24 Nails. 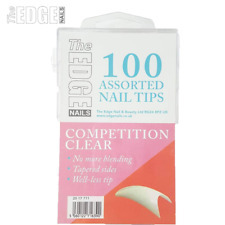 Check out the Elegant Touch Nail Guards we have listed too :D.
The Edge Competition Clear Nail Tips - Box of 100 Assorted Tips - perfect for creative nail art designs The Edge Competition Clear Tips have a point, no well area, they are completely well-less and are thin, flexible and easy to apply. No blending is required for these tips. 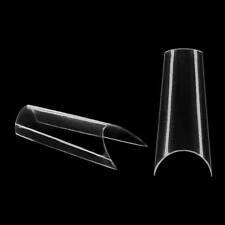 The Edge tips are made of virgin ABS plastic and offer both strength and flexibility. Computer designed to the strictest requirements to suit a wide range of natural nail shapes you as a technician may be faced with. A minimum amount of blending is required for these tips. 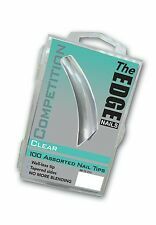 24 x Edge Nails Artizan Extreme Length False Nail Tips - Nail Art Thin Flexible The Edge Artizan Clear Nail Tips - Box of 24 Assorted Tips For extreme Avant Guard nail art designs, please note these tips measure almost 6cm in length they are very long and should be used by a professional! The Edge tips are made of virgin ABS plastic and offer both strength and flexibility making them easy to use. Computer designed to the strictest requirements to suit a wide range of natural nail shapes you as a technician may be faced with. A minimum amount of blending is required for these tips so again making it easier for the technician. The professionals choice!. Suitable for use with gel, acrylic or fibreglass applications. Box of 120 Classic Mosaic Nail tips Clear acryllic 3D nails which allow for an instant jewel like effect Boxed but unsorted All sizes in set. ET Elegant Touch Totally Bare Squoval Nails. Suitable for all nail types also compatible with all nail systems. CD-HairBeautyProducts - Established 1975. HARTLEPOOL TS24 7DA (U.K.). Empress 4 Eva. Prima Donna. - 24 Nails. This all-in-one manicure kit gives you pretty, perfect, ping-proof nails in minutes! Check out the Elegant Touch Nail Guards we have listed too :D.
Suitable for nail extension with nail art decorations / gel / acrylic / etc. Easy to apply and hold with nail glue. Suitable for nail extension / nail art display with nail art decorations / gel / acrylic / etc. You can add nail art decorations on the nails and design your own style and pattern. 100 PCS for size 4 and size 5, 50 PCS for other sizes. File the sides and cuticle area for an accurate fit with manicure stick;. 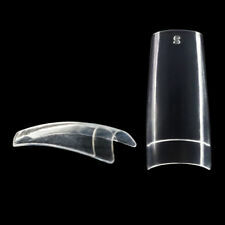 These strong fake nails are designed with translucent colour and full cover shape with moderate length and thickness. You can wear them long or clip them short. Brand New and Sealed YOU RECEIVE 34 PACKS Each pack contains 100 pieces in 10 different sizes (10 of each size) Free delivery, same day dispatch on all orders placed before 2pm. 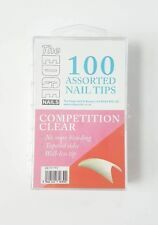 French Nails Clear Acrylic Tips for DIY Manicure Vanish or Gel Extension 10 Sizes Create that perfect French manicure look with this pack of 100 French nail tips. They come in 10 different sizes and can be clipped down with nail clippers or ideally with acrylic clippers. Suitable for professional studio's or home use. Features PROFFESSIONAL LOOKING NAILS- Achieve professional results fast.